This page summarizes experiences of management and working models for micro hydro power (MHP) in Peru. The owner needs to be clearly defined. A user committee is formed for oversight (usually based on existing community organisation). Often there is a need for training and awareness raising of consumers about the necessity to pay for electricity – and penalties for not paying on time. This issue is discussed below. First block: normally 60 - 70% of users – 20 kWh per month – enough for 2 or 3 lights and radio and possibly small black & white TV. First 10 kWh per month of this is fixed payment, regardless of whether consumed. In return for lower marginal tariffs these users agree to avoid peak domestic consumption hours for operation of heavy loads. 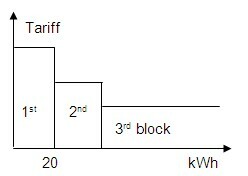 Metering is essential for this type of tariff structure but it might be possible to offer the option of energy limiters for the first block with a fixed monthly bill (perhaps less than that for the full 20 kWh). The advantage would be that consumers would know in advance their maximum monthly bill. Experience in Peru shows that expenditure by block one users is less than expenditure on kerosene, batteries etc. prior to electrification. The owner has an agreement with the operator, which is a small enterprise, selected by competitive tender, and which would normally require training – see below. Owner and operator are both represented on the users’ committee. The owner receives the users’ revenue payments from the operator on a monthly basis, together with a report on the state of the system and the list of bills paid.The operator is paid an initial base fee plus a regular fee (20% of revenue) and the remaining of funds go into a rural electrification fund for operating expenses, spare parts, maintenance costs, system expansion etc. The accounts are available for inspection by the users' committee. The owner provides all necessary tools and equipment and provides technical and management training to the operator. The operator must keep all equipment in good condition, carry out maintenance and provide regular electricity service and payment facilities. If the equipment is damaged by negligence of the operator then the operator is liable. The owner provides office and workshop for operator. billing and collection of payments in accordance wit tariffs agreed with owner. The operator agrees to provide good and prompt service to the users and allow access to equipment and books to owner and users association. Failure to comply with the agreement will involve penalties and possible termination of contract. The users committee is arbitrator of disputes between users and operator. The users committee normally consists of a president, vice president, secretary (who keeps minutes) and at least two others. Members serve for one year, renewable once and then cannot be re-elected for at least one year. overseeing the conservation of the electrical service. monitoring the operator’s monthly reports and deciding whether the contract should be renewed after the five year period. Members do not receive a salary but get 30% discount off their electricity bills provided they attend regularly. Users can ask the committee to arbitrate on disputes over bills with the operator and the committee's decision is final apart from the right to resort to other legal means. In the event of any dispute over a bill, the user must first try to solve it with the operator. If not satisfied, a user can then take his/her complaint to a member of the users' committee, who will hear both sides and then present his / her findings, together with his/her own opinion, to the committee. The committee who will vote on their decision. Tariffs, penalties, provision of public lighting etc are decided once a year. Average annual cost of operation, maintenance, generation, distribution, billing, tariff collection, spares, equipment and operator fees. Users are expected to pay within 15 days of billing. Penalties are applied for late payment per day. Consumers are disconnected if their payments are outstanding for three months, and re-connection is only done after payment of overdue bills including penalties and reconnection cost. Bills may need to include tax. Contract with the operator can be terminated if service is unsatisfactory.Normally for five years renewable. Operator is paid fixed fee on signing plus 20% of revenue collected for management and admin service. Most of the experience was gained before 2010, however it is still relevant. This page was last modified on 11 June 2015, at 11:53.